This Press Release photo from GM Photographic is an original October 1958 issue. The clarity and crisp detail in this and other 8×10 prints from GM Photographic is amazing. The original negatives were no doubt large format. To see the image in high detail, be sure to click on the image to get to its description page, then click the link above the photo that says 2048x. 1959 CHEVROLET – Release after 7.am. 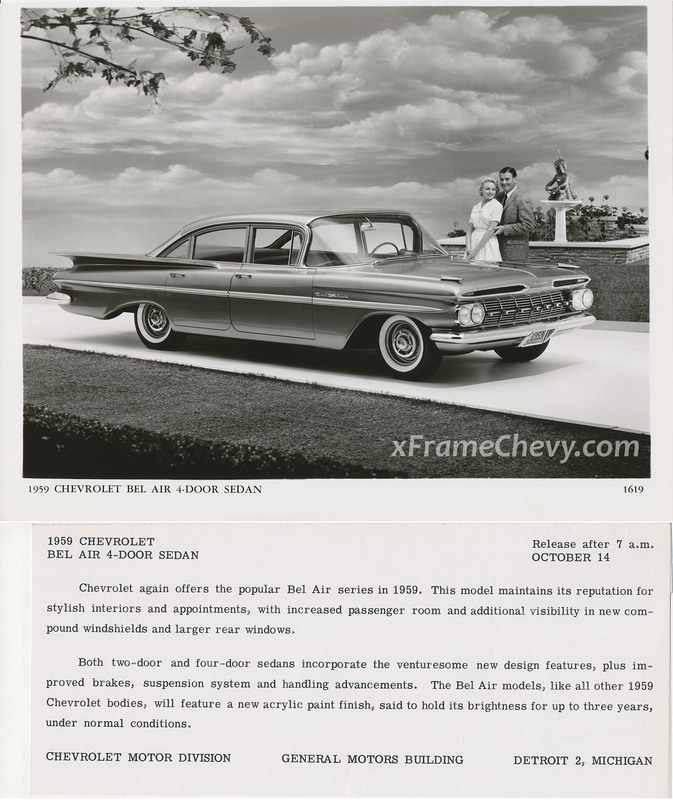 Chevrolet again offers the popular Bel Air series in 1959. This model maintains its reputation for styling interiors and appointments, with increased passenger room and additional visibility in new compound windshields and larger rear windows. Both two-door and four-door sedans incorporate the venturesome new design features, plus improved brakes, suspension system and handling advancements. The Bel Air models, like all other 1959 Chevrolet bodies, will feature a new acrlic paint finish, said to hold its brightness for up to three years, under normal conditions.